If Ambrose Moran’s claim is true that he worked with the ORCM, he has to be mentioned at least once, especially if he was consecrated a bishop in 1976. Ambrose Moran, we await evidence from the writings/words of Fr. Fenton that you truly worked with the ORCM. Ambrose Moran has made the claim that he worked with the Orthodox Roman Catholic Movement (ORCM). If that be the case, then I challenge Ambrose Moran to provide evidence of his name being mentioned in one of the ORCM’s own hard copy publications. Surely, he must be mentioned in at least one of them if he indeed worked with them. What say you, Ambrose Moran? Thank you, Fr. Hewko, for your courage in doing the right thing. 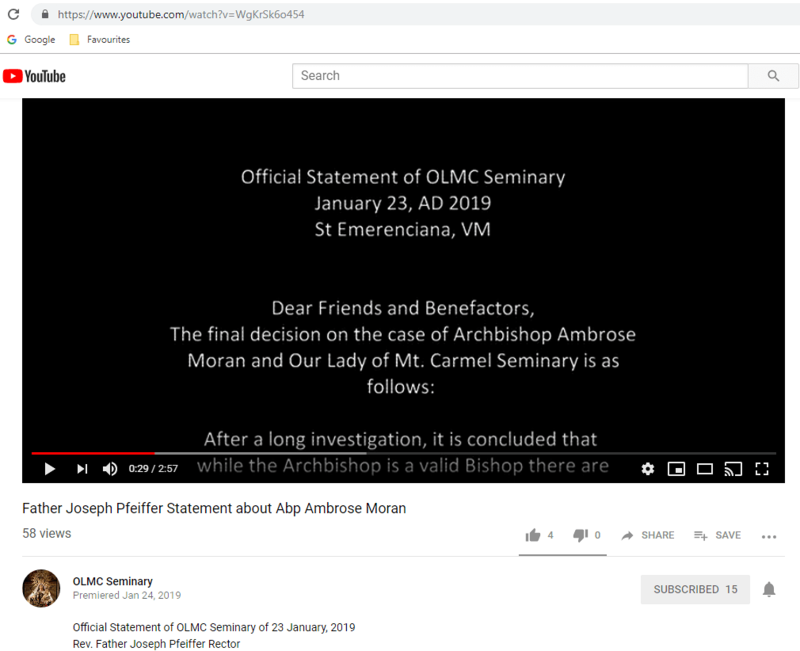 This following video contains the official and final statement of the Our Lady of Mount Carmel Seminary in Boston, Kentucky regarding Ambrose Moran. 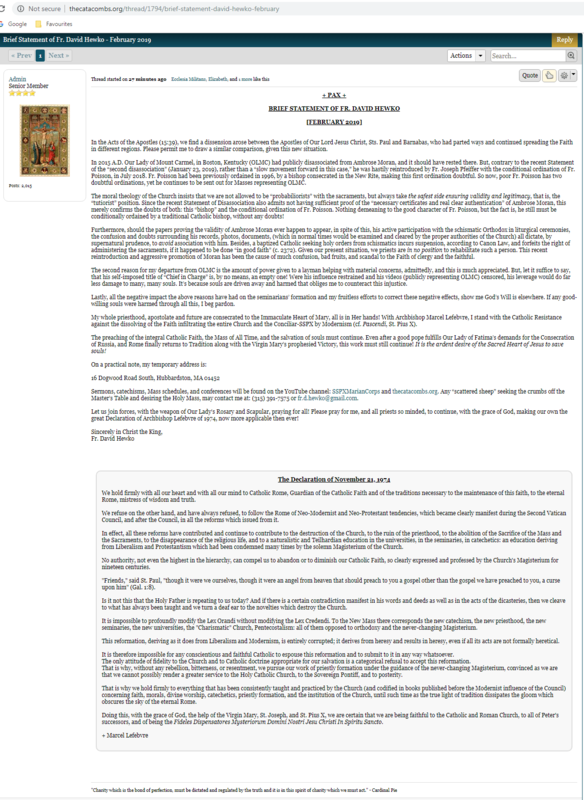 In this post, I expressed great dissatisfaction with the first communication of Fr. Pfeiffer regarding his putting a stop to using Ambrose Moran’s episcopal services. Since then, a new communication was posted on January 23, 2019 that included the first communication with additional material. Let us more closely examine some parts of this new communication. How did Fr. Pfeiffer come to this conclusion with certainty? 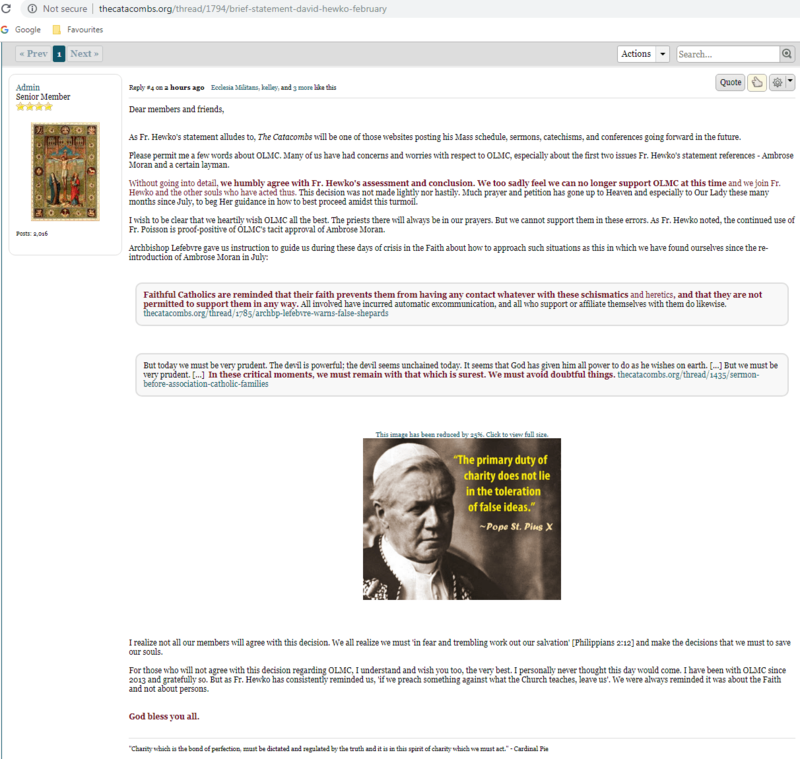 The truth is that, even if we grant that Ambrose Moran was consecrated by schismatic bishops, we cannot have a moral certitude that he is a valid bishop without the competent Church authorities thoroughly investigating his case. See here and here for more information regarding this matter. Ahh, but according to Fr. Pfeiffer, Ambrose Moran was consecrated a bishop in 1976 by Bishop Hryhorij, who was Catholic at the time, at the Holy Protection Cathedral. There were even, again according to Fr. Pfeiffer, other Catholic bishops who acted as co-consecrators at the same ceremony. Hold on. Fr. Pfeiffer started off asserting that Ambrose Moran is a valid bishop. Then he proceeds with putting into question that which he had just asserted as true. Well, is he a valid bishop or not? If he is a valid bishop consecrated by Catholic bishops, then what’s the problem? After all, it cannot be a show stopper that he is a liar because Fr. Pfeiffer, as attested by others, has stated that even if Ambrose Moran was found to have lied about being consecrated a bishop by Cardinal Slipyj, that would not stop him from using his ministerial services. On the other hand, if he is not a valid bishop, then what are these anomalies that put into question his validity? I think it is only fair that Fr. 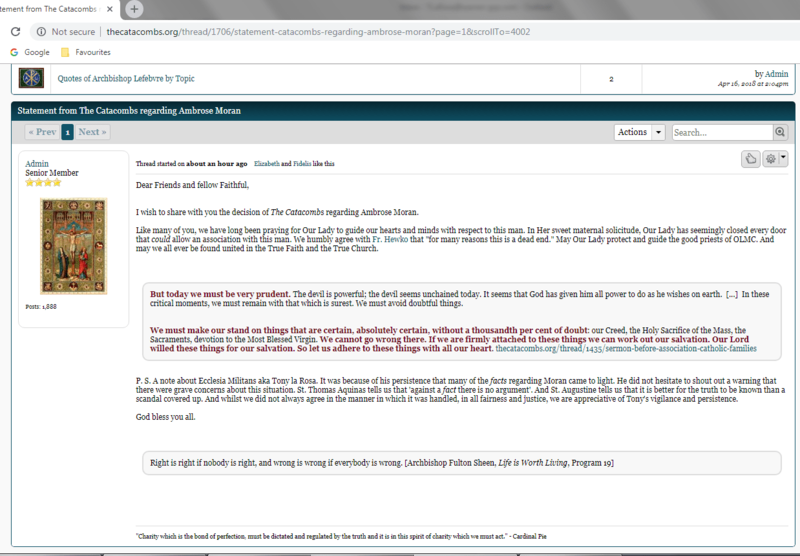 Pfeiffer brings forth these anomalies after spending so much time in sermons, conferences, and private discussions asserting that Ambrose Moran is a valid bishop and even criticizing those who questioned this assertion. Should that not read “did“? I am fairly certain that the communication would have been proofread over and over again before publication. 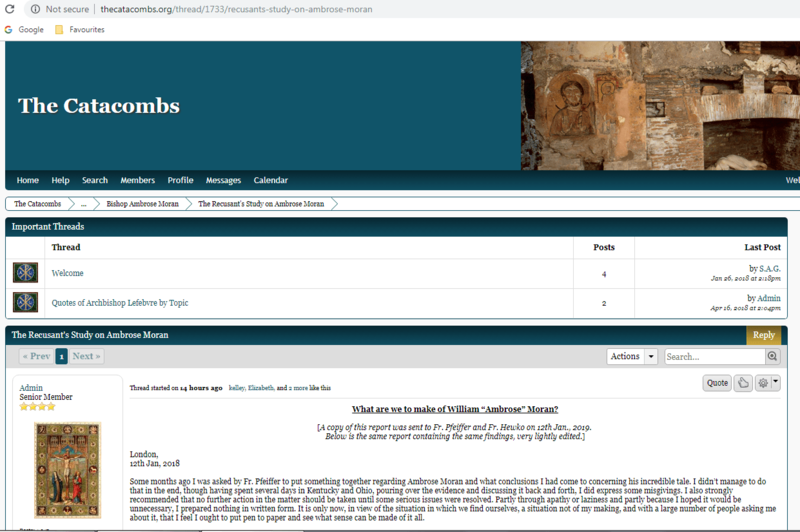 That the disassociation from Ambrose Moran is final and no longer open for debate is stated in the communication in the video, but it was not stated in the same communication posted on The Catacombs Forum. Hmm. Strange. 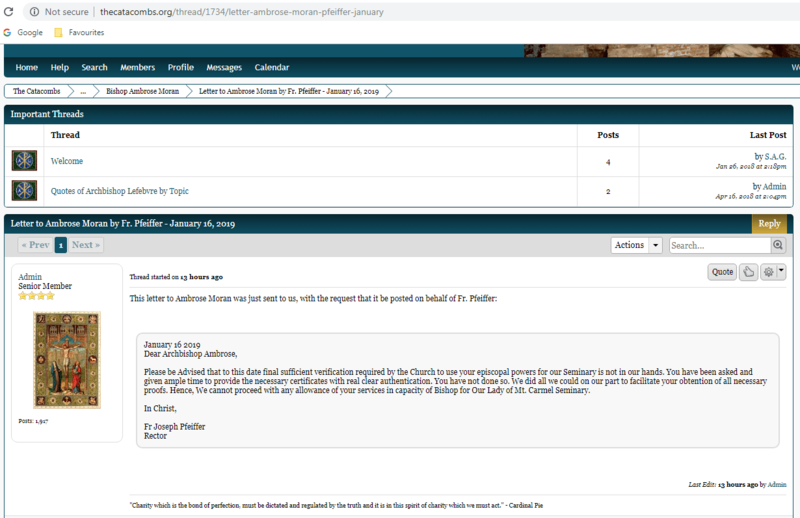 Is this communication sufficient to support again the Our Lady of Mount Carmel Church and Seminary for those who withdrew support? 1. I do not believe that this is a sincere retraction. Up until a couple of weeks ago, Fr. Pfeiffer was moving in the direction to further use Ambrose Moran for his episcopal services. I say “further” because remember that he used Ambrose Moran to conditionally ordain Fr. Poisson in July 2018. Fr. Pfeiffer heated up his promotion and defence of Ambrose Moran over the last few months despite the fact that priests and faithful, including mission coordinators, were trying to convince him otherwise. It was only when Fr. Hewko made his threat to leave OLMC did Fr. Pfeiffer stop. Furthermore, the first communication, which was awful, was all that Fr. Pfeiffer was originally going to issue. It was only after being pressed did he issue the second communication. 3. Faced with the facts as was Mr. Gregory Taylor, who was commissioned by Fr. Pfeiffer himself to investigate the Ambrose Moran case, the only prudent outcome is to call Ambrose Moran what he is, a liar. Instead, Fr. Pfeiffer uses weak terms like “inconclusive”. The reality is that Fr. Pfeiffer should denounce Ambrose Moran for the liar he is and to reject his ministerial services even if it can be proven with a moral certitude that he is a valid bishop. We do not need shady characters like Ambrose Moran in the Resistance. 4. In addition to denouncing Ambrose Moran, there should be some form of reparation made on the part of OLMC. First of all, to use Ambrose Moran for the conditional ordination of Fr. Poisson is, objectively speaking, an act of sacrilege because there is not a moral certitude that Ambrose Moran is a valid bishop. And even if there was a moral certitude that he is a valid bishop, the same conditional ordination would still be morally reprehensible, if not also an act of sacrilege, because Ambrose Moran to this day refuses to publicly admit and repent of his public schismatic past. Secondly, OLMC has done much damage to the unity of the Resistance with this Ambrose Moran affair (and for the second time). Next to Bishop Williamson’s public statement about the moral acceptability of actively attending the Novus Ordo Mass under certain circumstances, I would place the Ambrose Moran affair second, perhaps even a close second, in the detrimental effect it has had on the unity of the Resistance. Thirdly, Fr. Pfeiffer should not state that “this disassociation is final and not open for debate” if by this he means that he will no longer discuss the reasons for the sudden disassociation. After ramming Ambrose Moran down our throats, causing so much havoc, and criticizing those who provided opposition, elaborating on the “anomalies” seems to be a matter of justice. Let us continue to keep watch and pray! I thank Mr. Taylor for standing up for the truth despite his loyalty to Fr. Pfeiffer and OLMC. Good work! Praise be to Jesus, Mary, and Joseph on this Feast of the Holy Family!